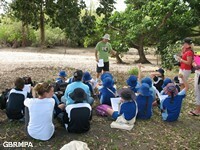 Reef Discovery: A very popular program for school groups that includes a one hour, entertaining introduction to the Great Barrier Reef. 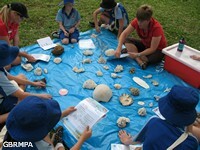 This interactive classroom presentation includes information on the formation of the Great Barrier Reef, common coral and fish identification plus information on how to best enjoy a visit to the reef. Fish ID: Did you ever wonder "What fish is that?" Well, with over 1500 species of fish on the Great Barrier Reef to pick from, it is indeed a challenging question. Join us for a fun-filled day of snorkeling and diving while learning how to identify the various fish families and species in the Whitsunday region. 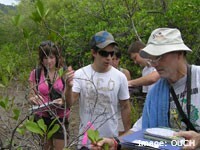 You will also gain a better understanding of the fish habitat and the role of fish in a coral reef environment. Responsible Human Interactions with Marine Life. 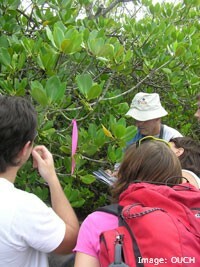 Life on the Edge: What do you know about life along the water's edge…the mangrove forests, the seagrass meadows? You are invited to join the OUCH Volunteers for a day of enlightenment and discover for yourself the complexities and mysteries of life along the water's edge. Right on our doorstep, you will encounter an environment that is as strange as it is complex. It is at the land/sea interface that you will find plants and animals that are equally at home above and below the water. Great Barrier Reef Tourism Staff Training Course: This program has been developed by the Great Barrier Reef Marine Park Authority (GBRMPA) and is a must for all those working on the reef. 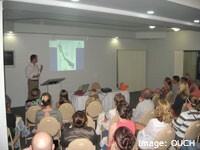 Interpretive reef programs are now an expectation with most visitors to the Great Barrier Reef. This course has been developed to provide tourism staff with the information and basic interpretive methods needed to inform visitors about the biology and management of the reef. 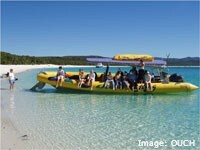 The program includes a 12 hour workshop run over 2 days plus a day of diving on the Great Barrier Reef. You will find the program to be both informative and good fun. As well, it will give you a chance to ask all the questions you may have about reef animals and the Marine Park. As well, you can contact the OUCH Volunteers for more information on our programs and projects. Want to organise a customised program for your group? Contact us to develop a program to suit your needs.